Singing is not that difficult and everybody can learn to sing. I have divided the singing techniques into four main subjects as listed below. By combining elements of these four subjects, you can produce precisely the sounds you want. You will also be able to pinpoint your specific problems and mistakes, and you can focus on which techniques you wish to work on. The four vocal modes – to choose the ‘gear’ you want to sing in. Sound colours – to make the sound lighter or darker. Effects – to achieve specific sound effects. This means working against the natural urge of the diaphragm to release the air that has been inhaled. This is achieved by resisting its movement. During singing, the waist muscles and solar plexus are pushed outwards whilst the abdomen around the navel is gradually pulled in, in a constant and sustained manner, and the back muscles are tightened. The muscles in the loin try to pull the pelvis backwards, while the muscles in the abdomen try to pull the pelvis up under your body. This battle created between the abdominal muscles and the muscles in the loin is a valuable and important part of support. However, the support must happen in a sustained and continuous manner as though working against a resistance for as long as a sound is being produced. 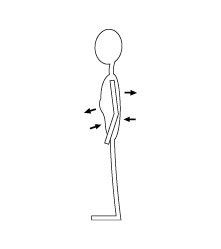 When the muscle contractions stop being sustained and continuous, for instance if you cannot pull the abdomen around the navel inwards any further or push the muscles of the waist or solar plexus outwards any further, then there is usually no more support. It is important to conserve your support energy so you do not waste it or use it at the wrong point in time. Do not use support energy before it is necessary. Save it for when the singing gets difficult, such as on high notes or at the end of a phrase. Support work is hard physical work so you should be in good physical condition. The area above the vocal cords forms a funnel; this is called the ‘epiglottic funnel’. 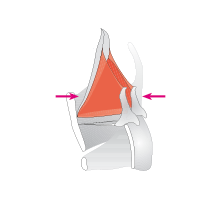 When twanging, the opening of the epiglottic funnel is made smaller by bringing the arytenoid cartilages closer to the lower part of the epiglottis (the petiole). As a result, the sound gets clearer and non-breathy, and you can increase your volume. You always need to use necessary twang in order to have correct technique and achieve easy and unhindered use of the voice regardless of the mode, sound colour and effect used. Necessary twang makes it easier to sing in all ways. For many, this necessary twang does not sound twanged at all. twanged at all. Avoid protruding the jaw and tightening the lips, as it often produces uncontrolled constriction around the vocal cords. Achieve a correct jaw position by bending your head back and placing a finger between the upper and lower jaw. Keep this position of the jaw as you sing. The lower jaw should be pulled backwards relative to the upper jaw. Be sure to open the mouth wider on high and low notes than on notes in the middle part of the voice. 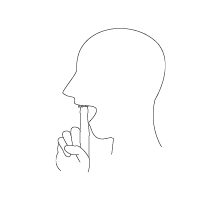 Whilst avoiding tightening the lips, it is also important to form vowels with the tongue without altering the shape of the mouth too much. Consonants on the other hand are usually produced by narrowing the vocal tract and by tension in the lips, but as you do not stay on them for very long in singing, they do not impair singing. It is important to be able to release the tension immediately going from consonants to vowels. There are two levels when working with the modes: the foundation level looking at the modes and the metal; and the advanced level, looking at the density of the modes. You can easily use the vocal modes without getting into their densities. When nothing is stated about the density, it is implied that the density is fuller. The use of the voice can be divided into four vocal modes: Neutral, Curbing, Overdrive and Edge. The modes differ by having different amounts of metal and different characters. The modes also have individual advantages and disadvantages in relation to pitch, volume and vowels. Most singing problems occur because of incorrect use of the modes. Each mode has a certain character, as well as advantages and limitations. To avoid mistakes and technical problems, it is important to know and control the modes, to use their advantages and to respect their limitations. It is also important to be able to change freely between the modes in order to make the most of their advantages. You can change smoothly, or make abrupt changes to achieve vocal breaks. Each of the four vocal modes should be trained individually and in different ways. Remember to obey the three overall principles regardless of the mode. Neutral is the non-metallic mode. It is a very extensive mode that contains many different sounds and sound colours. The sounds are softer and milder than the metallic modes. When starting out, Neutral can be found by establishing a loose jaw. The Neutral mode has through time also been called classical, but this is misleading, as classical singing just as often uses the metallic modes. Neutral is also used when singing popular music. Therefore, I have chosen the name Neutral to describe the mode, because I felt the mode needed a more unbiased, ‘neutral’ term. The Neutral mode extends from notes that are soft and breathy to notes without air added. The two extremes within Neutral are called ‘Neutral with air’ and ‘Neutral without air’. For clarity, the two extremes of Neutral are sometimes shown separately, as they have different demands and possibilities. This means we can talk about ‘Neutral with air’ and ‘Neutral without air’. All parts of the voice, all vowels, and all sound colours can be used in Neutral by both men and women. Neutral is limited by volume. In general, it is a quiet mode, but there are exceptions. It is possible to obtain greater volumes in Neutral without air than in Neutral with air. Very loud volumes (‘ff’ or ‘fortissimo’), however, can only be obtained in Neutral without air and only in the high part of the voice (from C5 upwards for women and C4 upwards for men). Other than this, the volume is generally quieter. In the western world, Neutral is normally the mode in which women start getting tuition. This is most likely because many people have been brought up believing that the character of Neutral is the best suited to school choirs and church choirs etc. Both classical male and female singers use Neutral without air when singing quietly (pp-mp) in their entire range, for example in connection with thinning (decrescendo) and singing in pianissimo. Women use Neutral without air in classical singing in all volumes in the high part of their voice. Men use Neutral without air in classical singing when singing medium to loud (mf-ff) volume with a non-metallic character in the high part of their voice. In everyday life, Neutral is used when you speak or sing quietly. The character of Curbing is restrained and it is reduced metallic. The sound could be described as slightly plaintive, lidded, held-back, or restrained. Curbing can be found by establishing a light ‘hold’. Curbing contains various amounts of metal, from a minimal amount, like 1%, up to around 70% metal. You cannot add air to the voice in Curbing; even attempting it may result in straining the voice. To ‘Curb’ means to ‘hold’, to ‘tame’, to keep ‘under control. I have chosen the name ‘Curbing’ because it, in my opinion, describes what it might feel like to sing while holding back the sound and thereby giving it its restrained character and preventing it (or ‘curbing’ it) from becoming fuller metallic. Men can use Curbing through all the various parts of the voice. Women can use Curbing through all the various parts of the voice up to the High C. Women cannot sing in Curbing in the very high part of the voice. There is no lower limit, but the character becomes more restrained in the lower part of the voice. Men can use Curbing in all pitches, but the mode does not work well in the low and very low part of the voice. The sound becomes more and more restrained, weaker, and more ‘squeezed in’, as you approach the lower part of the voice, until it simply disappears. Women can use Curbing through all the various parts of the voice, up to the High C but again, it does not work well in the low and very low part of the voice. Women cannot sing in Curbing in the very high part of the voice. Curbing is used for artistic reasons when a singer wants to sing with a slightly plaintive, held-back and restrained character, or if a singer sings the vowels ‘O’ (as in ‘woman’) and OO’ (as in ‘you’) in a relatively loud volume with some amount of metal. In Curbing, you can use the vowel ‘UH’ (as in ‘hungry’). The ‘UH’ encompasses many vowel nuances as many vowels can have an ‘UH’ sound. Also, the vowels ‘O’ (as in ‘woman’) and ‘OO’ (as in ‘you’) can be used in Curbing when sung with a relatively loud volume. Curbing largely stays in the medium volume range, from medium quiet (‘mp’ or ‘mezzo piano’) to medium loud (‘mf’ or ‘mezzo forte’). Very quiet (‘pp’ or ‘pianissimo’) and very loud (‘ff’ or ‘fortissimo’) volumes are not attainable. The sound colour can be altered extensively. Curbing is used in many styles of popular music (such as R & B music) when the volume is medium loud and a certain amount of restrained metal is required. Curbing is used in classical music (does not work well in the low and very low part of the voice), when singing medium loud volume (mf) with a restrained character. (The metallic character is often difficult to hear as it is disguised by a darker sound colour). Men can use Curbing in classical singing in their entire range, when a medium loud volume and a restrained character is wanted. Women use Curbing in classical singing in the middle part of the voice, when a medium loud volume and a restrained character are wanted. Curbing is used in everyday life when you are wailing, moaning or whining. Overdrive can range from reduced to full metallic. The character of Overdrive is clear, often direct, bright, unrestrained, and shouty, like when you call ‘hey’ after someone in the street. Overdrive is a mode with a non-breathy sound. When starting out, Overdrive can be found by establishing a ‘bite’. Overdrive contains all amounts of metal, from a minimal amount, like 1%, all the way to 100% (full) metal. You cannot add air to the voice in Overdrive; even attempting it may result in straining the voice. I have chosen the name Overdrive because I find it descriptive of the direct, bright, clear and loud sound you can obtain in this mode. My inspiration for the name is from the overdrive that can be found in guitar pedals and from the fifth gear in sports cars (i.e. overdrive gear). In terms of pitch, Overdrive is the most limited mode. It is especially limited for women. The upper limit for women is D5 and for men C5. There is no lower limit. In Overdrive, you can only use the vowels ‘EH’ (as in ‘stay’) and ‘OH’ (as in ‘so’). The volume in Overdrive is medium loud to very loud. In the beginning the higher the note, the louder and more distinct the “shouting” character becomes, and the more distinct the difference in volume and character from Neutral and Curbing. When you have obtained a greater control over Overdrive, you can use it in medium volume where the character becomes less Overdrive-y/shouty. The sound colour can be altered quite a bit. Overdrive is the most commonly used mode for men and women in the low part of the voice and when speaking or singing loudly. Overdrive is used in almost all styles, when singing low, or when the volume is medium to loud and when a degree of clear metal is desired, for example in rock music. Overdrive is used in classical music when singing medium loud to loud (mf-ff) and a clear character (the metallic character is often difficult to hear as it is disguised by a darker sound colour). Men can use Overdrive in classical singing in their entire range. (Observing the pitch limit of C5). Women are mostly using Overdrive in classical singing in the lower part of the middle part and in the low part of the voice when singing medium to loud (mf-ff), for example like Maria Callas. Edge can range from reduced to full metallic. The character of Edge is clear and could be described as direct, bright and unrestrained, yet lighter and sharper than Overdrive. Edge has a non-breathy character. Edge can be found by maintaining a clear character and adding the distinct twang of the epiglottic funnel (as if imitating a duck). Edge contains all amounts of metal, from a minimal amount, like 1%, all the way to 100% (full) metal. You cannot add air to the voice in Edge; even attempting it may result in straining the voice. I have chosen the name Edge because I find it descriptive of the bright, clear and sharp sound you can obtain in this mode. Men can use Edge in all pitches. Women can use Edge through all the various parts of the voice up to the High C. Women cannot sing in Edge in the very high part of the voice. There is no lower limit. Only twanged vowels can be used in Edge, as distinct twang, and a clear character are conditions for the mode. Accordingly, you must use only ‘I’ (as in sit), ‘EH’ (as in ‘stay’), ‘A’ (as in ‘and’), and ‘OE’ (as in ‘herb’). The volume in Edge is medium loud to very loud. In the beginning the higher the notes, the louder and more distinct the sharp character becomes, and the more distinct is the difference in volume and character from Neutral and Curbing. When you have obtained greater control over Edge, you can use it in medium volume, where the character becomes less Edgy/sharp. The sound colour in Edge can be altered less than in the other modes, especially in the high part of the voice. Edge is used in almost all styles, when the volume is medium to loud and there is a degree of clear metal in the notes. Examples include heavy rock, gospel, R&B and pop music. Edge is used in everyday life when you speak and sing in medium to loud volume, and loud Edge is used in everyday life when you scream. The modes also differ in the amount of density they contain. When you have successfully worked with the information about the modes and metal, the modes and their densities will give you a deeper understanding. By looking at the modes in terms of density, you can develop a more advanced understanding of the modes. You do not need to work with the mode and densities to use the modes. So, if working with density creates problems, return to the modes and metal to secure your understanding of the modes at foundation level. You can easily use the vocal modes without getting into their densities. Neutral can range from reduced to full density. This means we can talk about ‘Neutral with air’ in fuller density and ‘Neutral without air’ in fuller density; and ‘Neutral with air’ in reduced density and ‘Neutral without air’ in reduced density. Using reduced density in Neutral does not affect all elements of the Neutral mode. Generally, the advantages, limitations, and rules of the mode are the same for reduced density as for fuller density. Reduced density Neutral does not require much support energy, so by singing with reduced density, singers can spare themselves. Reduced density Neutral exists in all pitches but can be difficult in the lower part. The reduced density in Neutral is useful for singing above the high C (C6 for women, C5 for men). Singers use reduced density Neutral without knowing it, often above the high C.
Using reduced density in Neutral will not in general affect the vowels. You often need reduced density in Neutral when singing quietly in volume 0-2 and frequently in the higher part of the voice, for instance when making a pianissimo or thinning even more quiet. Using reduced density will not in general affect the sound colour. You also need reduced density for creating the ‘snapping’ sound in Vocal Breaks. The reduced density in Neutral is useful when a singer wants to ‘mark’ instead of singing with more volume. But apart from this, the choice of using reduced density in your singing should be an artistic choice, where the thin or hollow sound that characterises reduced density is specifically wanted. Reduced density is used in various styles of singing, for instance pop, R&B and folk. Curbing does already have a reduced density, so the description from above also fits in here. The amount of density can be altered from reduced to very reduced, let’s say from 50% density to 20% density. The more the density is reduced, the more plaintive, lidded, held-back, or restrained the character becomes. The choice of reducing the density further in Curbing should be an artistic choice, where the more plaintive, lidded, held-back, or restrained sound is specifically wanted. Overdrive can range from reduced to full density. Using reduced density in Overdrive does not affect all elements of the Overdrive mode. Generally, the advantages, limitations and rules of the mode are the same for reduced density as for fuller density. The reduced density in Overdrive is useful when a singer wants to have the sound of Overdrive, but with a contained, held-in, metallic character. The reduced density does not require so much support energy, so by singing with reduced density, singers can spare themselves. Reduced density in Overdrive exists in all pitches but can be difficult in the lower part. It is important to be aware of the general pitch limit in Overdrive, especially for women. The vowels in reduced density Overdrive are the same as in fuller density, but the vowel sounds have a contained and held-in character. The volumes in reduced density Overdrive stays in the medium volume range, from medium quiet (‘mp’ or ‘mezzo piano’) to medium loud (‘mf’ or ‘mezzo forte). Using reduced density in Overdrive will not in general affect the sound colour. The choice of using reduced density in Overdrive should be an artistic choice, where the more held in and contained sound that characterises reduced density in Overdrive, is specifically wanted. Reduced density in Overdrive is used in various styles of singing, for instance pop, R&B and Christian rock. Edge can range from reduced to full density. Using reduced density in Edge does not affect all elements of the Overdrive mode. Generally, the advantages, limitations and rules of the mode are the same for reduced density as for fuller density. The reduced density in Edge is useful when a singer wants to have the sound of Edge, but with a contained, held-in, metallic character. Reduced density in Edge exists in all pitches but can be difficult in the lower part. The vowels in reduced density Edge are the same as in in fuller density, but the vowel sounds have a contained and held-in character. The volumes in reduced density Edge stays in the medium volume range, from medium quiet (‘mp’ or ‘mezzo piano’) to medium loud (‘mf’ or ‘mezzo forte). Using reduced density in Edge will not in general affect the sound colour. The choice of using reduced density in Edge should be an artistic choice, where the more held back or contained sound that characterises reduced density in Edge, is specifically wanted. Reduced density in Edge is used in various styles of singing, for instance pop, R&B and Christian rock. All modes can be lightened or darkened, though some more than others. The sound colour is created in the vocal tract, which is the space above the vocal cords extending to the lips and including the nasal passages. The form and size of the vocal tract is of great importance to the sound colour. All singers have different vocal tracts, so all singers have their own personal sound colour. If the vocal tract is large, the sound colour will be darker. If it is small, the sound will be lighter. The shape of the vocal tract can be altered in many directions so there are many ways of changing the sound colour of your voice. Remember to obey the three overall principles and to be in control of the chosen mode before changing sound colour. 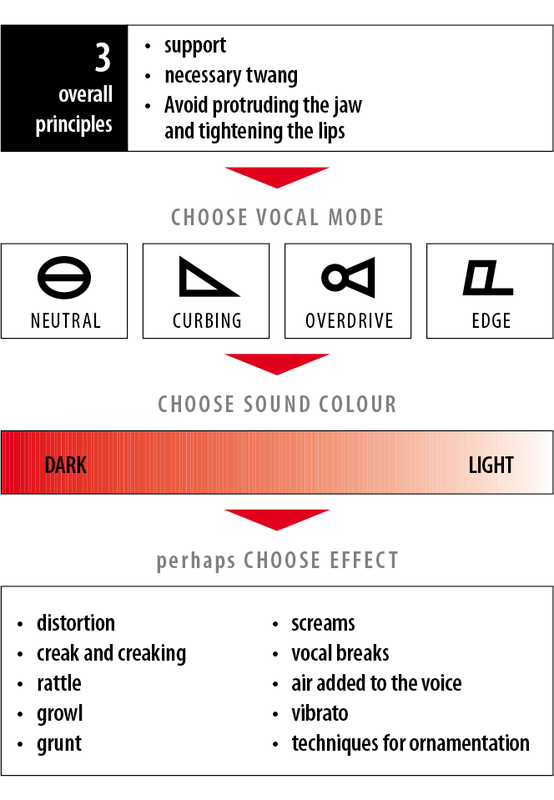 Each of these factors can and should be trained individually in order to get to know each factor’s influence on the sound colour. Once you can control each factor individually, they can be combined in different ways to achieve different sound colours. Effects are sounds that are not connected to melody or text but are sounds that underline the expression or style of a singer. 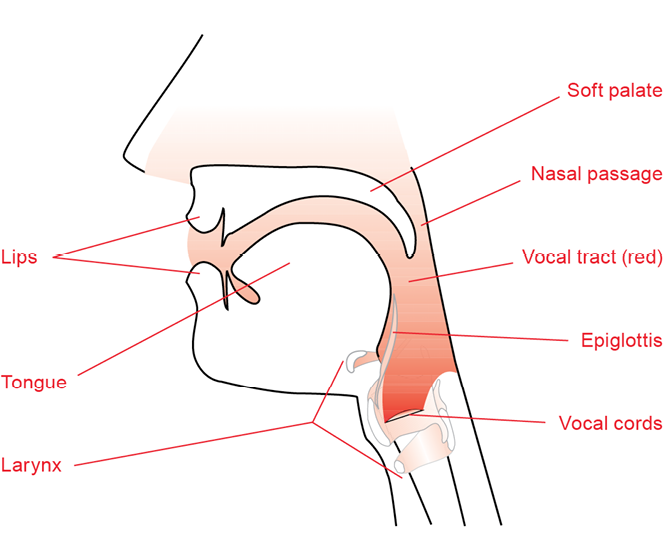 All effects are produced in the vocal tract. Besides controlling the technique for the effects singers have to take into account her/his fitness, energy level, and temperament. Before you start working with effects, it is important that you can control the three overall principles, the chosen mode, and the sound colour.